Ju and are both keen climbers and hill walkers so we tend to wear general purpose fleece jackets and the like rather than specialist cycling clothing. It has to be said though that windproofness is important for cycling so ordinary fleece jackets are not particularly good. My bottom is too bony to pedal comfortably without padded shorts. The picture on the left shows a new pair I bought in Italy when the pair I brought from England wore out. They are slightly shorter than the old pair! Cycling mitts are essential too to protect from all that jarring. Mine are actually sailing gloves which I think are better if it is very wet because they are made of wetsuit neoprene and leather without any absorbent padding. I took a Lowe Alpine shirt with me which I found to be very useful against the mosquitos and incredibly easy to clean. The fabric is rather stiff but better that than being eaten by mosquitos! Poncy thermal underwear underpants from manufacturers like Helly Hansen and Patagonia are horribly expensive but dry much quicker than cotton underpants. The best ones have anti-bacterial impregnation so they don't smell if you can't wash them! During the winter I never took my thermal top off for a week at a time! 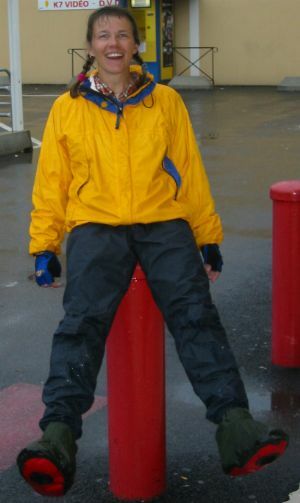 The "man from the planet Zarg" photo is me in my cold weather gear, RAB duvet jacket, nylon fronted cycling longs (keeps out wind and some rain or snow) and waterproof overbooties. The mitts are Wild Country 'Extremities' mountaineering mitts, very warm and totally waterproof. The duvet jacket is particularly good for cold weather cycling because it is windproof and very warm but packs down small. We also sleep in them inside our sleeping bags when it is sub-zero. It's a pity that they are wearing out (they were already quite worn at the start of the trip) because I think Shimano SPD sandals are just the best. I wear them all the time. It shows! 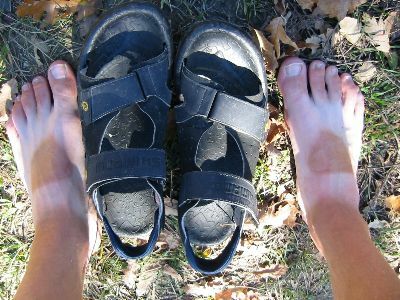 For winter of course the sandals are not so good. Instead I have SPD mountain biking boots. The problem with these is that they tend to leak from the cleat hole so if you stand in a puddle or walk on snow you get wet feet. The best solution I have found is neoprene wetsuit socks! These are totally waterproof and equally effective wet or dry. You can wear a pair of ordinary socks inside them to make them warmer although they do get a bit sweaty. I didn't have all these clothes all of the time, but the complete list for winter and summer is as follows. All my clothes and my sleeping bag fitted in one pannier.